Through the efforts of the ICSU-WDS and RDA Data Publishing Services Working Group, and a number of key global players in research information, the Scholix global framework was developed to present vision and guidelines for exchanging information about the links between scholarly literature and data, using a common, global approach. On 20th June 2016, the International Council for Science World Data System (ICSU-WDS) and the Research Data Alliance (RDA) Working Group on Data Publishing Services, and a number of other key global players in research information announced the launch of Scholix (Scholarly Link Exchange) framework. support credit attribution mechanisms thus enhancing transparent evaluation of science. 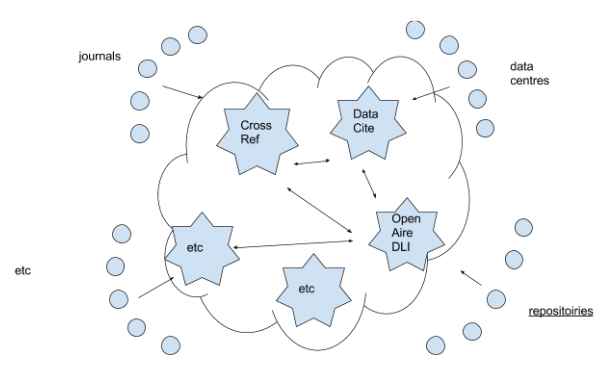 Data-Literature Interlinking (DLI) Service, DataCite Event Data, Crossref Event Data and Linked Clinical Trials are the first exemplar aggregations and query services fed by the Scholix open information ecosystem. Feed your data-literature link information to an existing Scholix hub using your existing community standards. 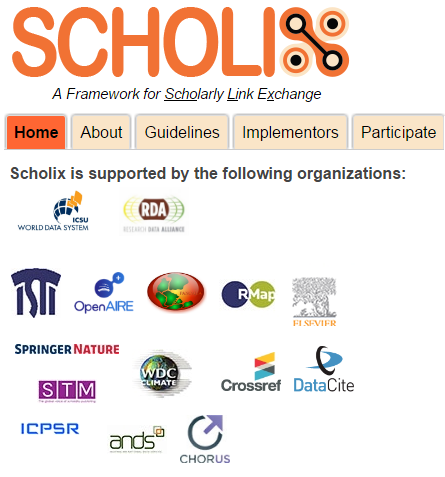 Become a Scholix hub and share your data-literature link information using the Scholix Guidelines (Interoperability Framework Recommendations). In this case your service will be registered with other Scholix hubs and aggregator service on the Scholix implementors web page. The hubs agree on an interoperability framework with a common information model and open exchange methods, optimized for exchanging information among the hubs. by contacting info@scholix.org or by joining the the RDA-WDS Working Group on Data Publishing Services. The Working Group encourages you to follow proposed best practices and recommends further work be done in identifying appropriate standards and principles applicable for each sub-set of the interoperability framework that should underpin a global data-literature information eco-system. based on common information models and negotiated exchange protocols that facilitate the generating, sharing, aggregating and exploitation of the links between research data and the literature. Over time, Scholix approach could be extended to other types of research objects in and beyond research (e.g. software, tweets, etc).